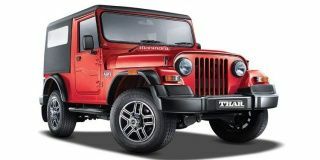 Mahindra Thar price starts at Rs.6.83 lakh (Ex-Showroom, Delhi) and the top end variant Mahindra Thar CRDe is priced at Rs. 9.60 lakh (Ex-Showroom, Delhi). The poor man’s Jeep Wrangler is offered with two engine options - a 2.5-litre m2DICR engine and a 2.5-litre CRDe. The former of the two produces 63PS/195Nm and is available with two- or four-wheel drive systems. The latter is tuned to generate 107PS/247Nm and is the one to opt for. Both engines come mated to a 5-speed manual transmission, whereas the 4WD variants feature a low-range gearbox as well. It is this off-roading tech and the availability of a mechanical differential lock that makes the Thar simply one of the best vehicles to go serious off-roading in. There is no automatic as off n ow. Maybe that will come into the equation with the new-gen Thar which, by the way, is being developed. Mahindra hasn’t bothered to reveal the mileage figures no matter how bad we want it. Q. Can we fit front seaing seat in crde. model ? Q. How is the performance on road? Q. We are looking to purchase a Thar CRDE. The usage would be a mixed bag of city, long distance and a bit of off-roading. I understand that there is no rear AC vent, does this mean that air circulation is hard for people at the back. Also, how is the rear suspension? Q. What are the safety features and does it have air bags? Q. Is Thar perfectly suitable for city usages? Q. Is open top available in Thar? Thar comes with soft top which is removable.